BMW Bike Rentals is a family run business established 10 years ago by Mark and Lindsay Comer. Our goal was to offer class leading, quality motorbikes at affordable prices. We have grown to be one of the leading BMW and adventure bike rental companies in Spain. We are the only Spanish motorbike rental company to offer multi-location pick-up and drop-off in Spain and Morocco as well as very competitive accommodation packages. Our head office is based in Malaga with satellite offices in Barcelona, Madrid and Marrakech. We offer collection and return of motorbikes at airports throughout Spain and Morocco. We endeavour to offer you the best possible service by providing bikes that are thoroughly and regularly maintained at excellent prices with flexible rental terms. We also offer beautiful, comfortable accommodation with low cost package deals. We do all we can to make sure you get maximum enjoyment from your holiday. We have a vast knowledge of Spanish roads, in particular Andalucia where we are on hand to provide tips and advice. We offer tailor made tours of Spain and Morocco with our very experienced multi-lingual tour guides. The tours can be for groups of 2 to 25 and for riders with different levels of experience. Support vehicles are always provided. Furthermore we provide bikes and support vehicles for privately run tours with their own guide. Our fleet consists of older models BMW R1200 GS, BMW F 800 GS and BMW F 650 GS motorcycles which are ideal for the types of riding terrain in Spain. Our prices are keep low by using older models of sort after bikes. All bikes are keep up to date with a rigorous maintenance schedule to ensure a trouble free holiday. Recently we added Triumph adventure models and the fantastic Honda VFR800 to our range. 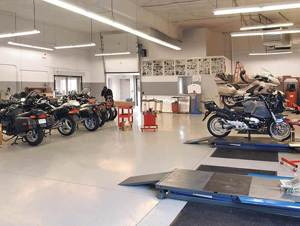 All bikes are equipped with side cases and top boxes and come with full European roadside assistance. When staying at La Calera, Lindsay loves to cook and we offer a wide selection of food, whether it be a barbecue or a paella for a group, a full English breakfast or a romantic dinner for two. Motorcycle groups are especially catered for so please do not be afraid to make any special requests, we want to make your biking holiday better than you could have wished for.